Most people rarely bother to delete their browsing histories, if ever, which means that they can always find webpages long forgotten in the chaos of the World Wide Web. Some of us, however, tend to use multiple PCs and despite the many cloud-based enhancements of today’s world, connecting with a single account is not always an option which leads to the browsing history being lost forever. For instance, using a computer in a library or another public location means that everything you do will automatically be deleted once your session ends. This can be extremely frustrating when you have spent hours researching online and you cannot find a couple of persistently elusive pages whose names you will never be able to remember. Luckily for you, there are plenty of ways to export your browsing history so you can read it whenever you want at a later point. Today’s session is heavily focused at Chrome and Firefox as they both offer numerous tools for the purposes of extracting and exporting their browsing history. 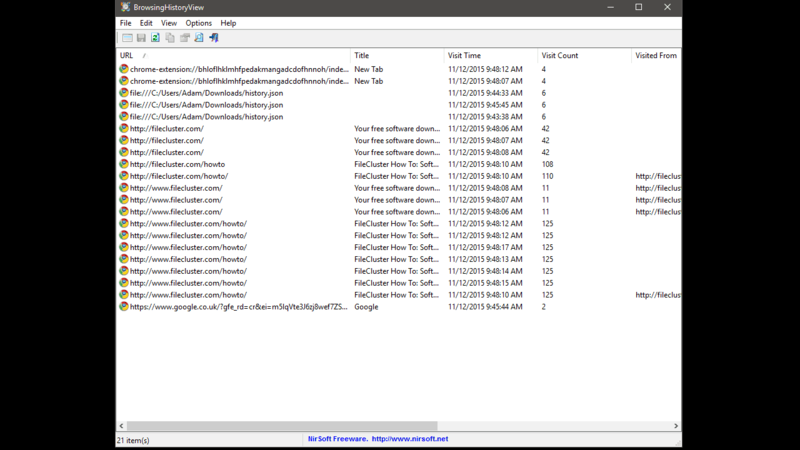 Firefox and Chrome store browsing histories in the SQLite database format so you can technically grab those files and export them with another application into either text or HTML files. Doing so is quite complex though so we will be looking at alternative methods which will make your life easier. With that said, Chrome’s History page is formatted in HTML like any other page so you can actually save it as a file in your computer and then open it in any browser (not just Chrome). The page will be a bit broken as it no longer contains the exact structure found in Chrome but it is still very readable as you can see below. Go to the History page by pressing Ctrl + H or by opening the menu and selecting the History > History options. Right-click on the page and select the “Save As” option. Make sure that the “Webpage, Complete” option is selected in the “Save as type” field and click on Save after choosing a location to store the history file. To read the HTML file, double-click on it and it will open with your default browser. The excellent BrowsingHistoryView is a very small utility that supports most modern browsers including Chrome, Opera, Firefox, Internet Explorer, Edge, and Safari. It allows you to read the browsing history of all supported browsers in a neat interface which you can then sort according to your needs and export to various file formats. Using the app is extremely simple. After you download it via the provided link, extract the files in a location of your choice and run the executable file. The app is portable so it needs no installation. Once you launch it you will be presented with a window titled “Advanced Options”. Despite the name, navigating around this window could not be easier. 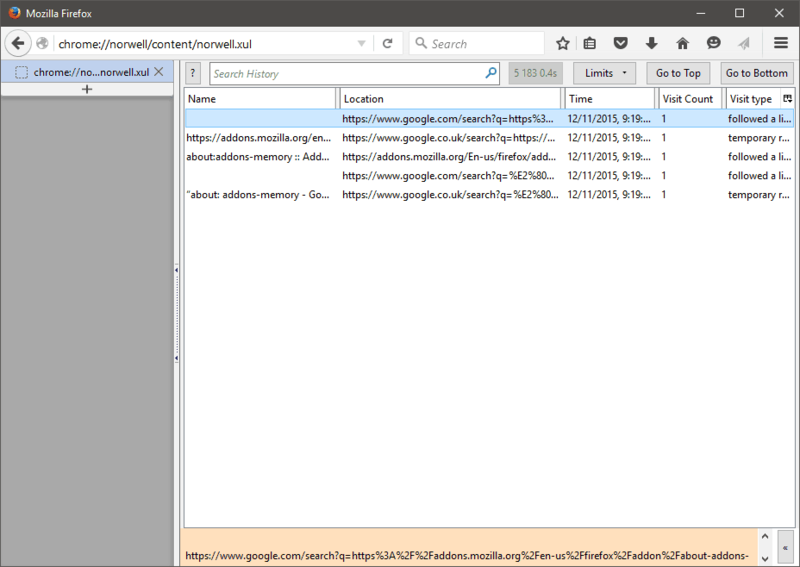 By default, BrowsingHistoryView will grab the browsing history of all supported browsers from the last 10 days. The browsing history dates can be changed via the very first dropdown menu while the desired browsers can be selected by their respective checkmarks as you can see below. The default settings will grab the history from all the users in your computer so make sure to change the “Load history from” option if you want more specific options. When you are done with your choices, click on OK and the app will retrieve the browsing history automatically. The process is extremely fast so you will not wait more than a few seconds. The listed items are sorted by URL by default but you can change that by clicking on the headers. Clicking on the “Visit Time” header will list the items by date, for instance. To export the browsing history you will first need to select which items you want to keep. To select everything, press Ctrl + A. To select multiple items, press and hold the Ctrl button and click on your desired items. When you are ready, go to File > Save Selected Items or just press Ctrl + S. Select a location to store the file, give it a name and then choose what your file will look like via the “Save as type” dropdown menu. I would recommend choosing the “HTML File – Horizontal” option as it can be read in all computers and the presented list is easy to get through as you can see in the image below. 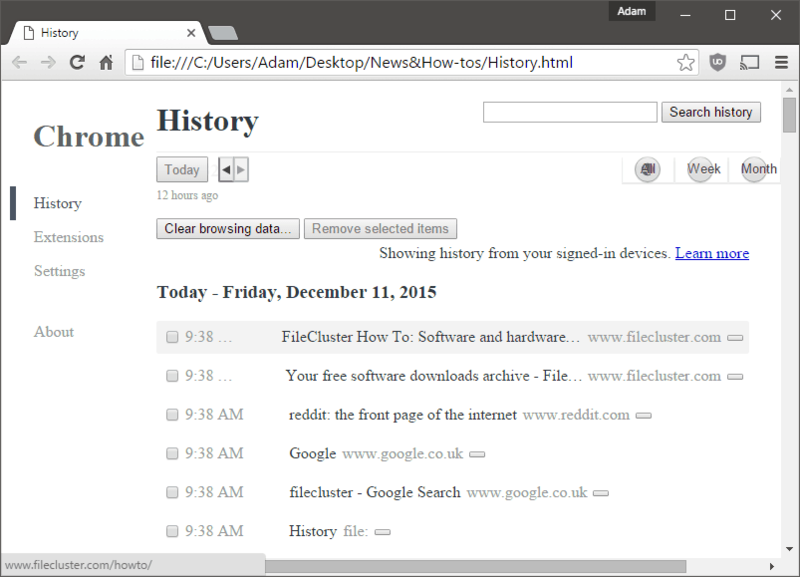 Both Firefox and Chrome have a range of extensions that can help you export your browser history. The problem with these tools is that they need to be installed in the browser itself, something that may not be possible in some public computer environments. However, the fact that they are integrated into the browser means you can access them easily and quickly at times you need them the most. This will open up Norwell’s advanced history page where you will be able to view visited locations along with time accessed, visit count, and more. Firefox: Click on the menu icon, click on the question mark (?) and select the “Troubleshooting information” option. On the page that opens, click on the “Show Folder” button and a Windows Explorer window will appear. This is your profile page where you can find a file called “places.sqlite” which contains Firefox’s history. Chrome: Press WinKey + R to bring up the Windows Run box. Type %localappdata% and press Enter. Then, navigate to Google > Chrome > User Data > Default and you will find the appropriately named History file. On Chrome, Export History is the only extension made specifically for this purpose. 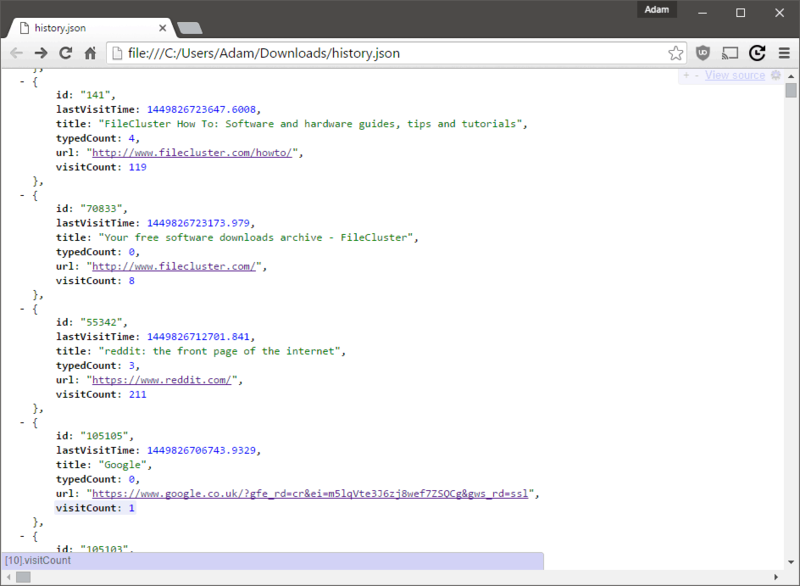 In the free version, users are only allowed to export history as a .json file. 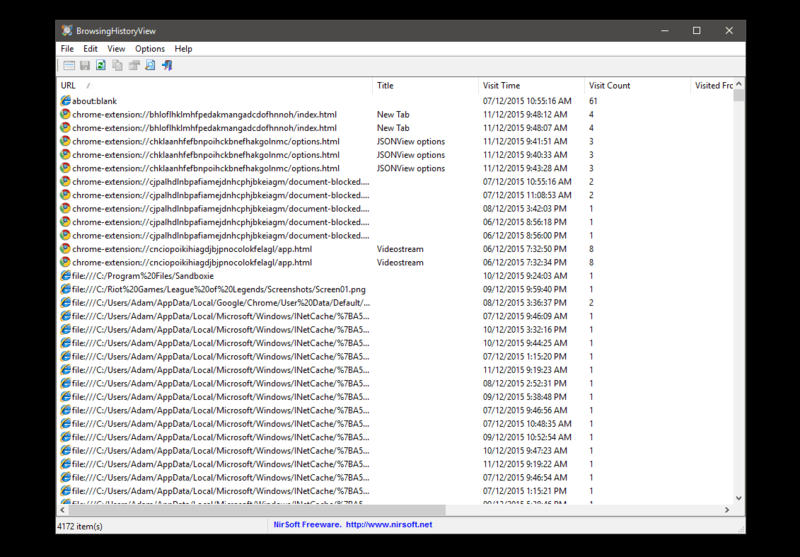 Such files can be read as a regular webpages after installing the JSONView extension (though you may need to go into the Extensions menu and enable the option that reads “Allow access to file URLs”).The paid version also lets you export as .csv so you can view your history on Excel. If you do not want to go through all this trouble, use one of the methods outlined above. 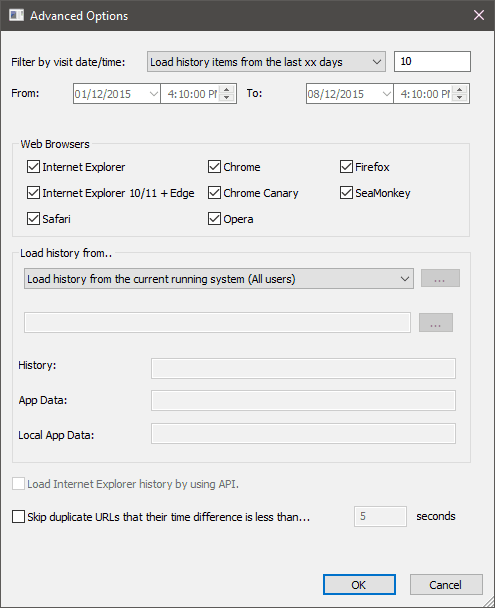 After all, quickly grabbing your browsing history on Chrome is as easy as a right-click.